Its been literally a while since I did a haul post , I dedicated this post to the much raved & talk of the town brand 'Color Studio Pro' . Its been a while since they launched their products & got popularity as time passes cause of their good quality products . I got their products some where in June 2012 but since then my camera broke down I couldn't update my blog nor can took pictures . But Wohaa!! I gotta new cam so here I am with a flood of my pending posts , reviews etc . After going through all those raved reviews by Pakistani Beauty Bloggers I decided to try this brand out & Im happy I am not disappointed. Reviews will be up soon , as Im already using them but if you want me to review something first . Just leave your comments below . 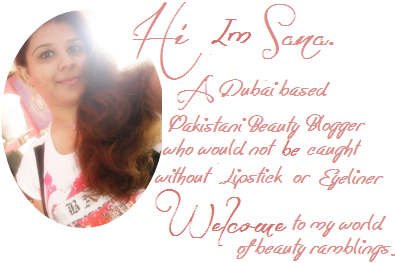 5 comments on "Color Studio Professional Haul "
Woww sana i liked the CSP brand alot and i am looking forward to get my hands on few of thier stuff :) Thanks for the inofrmative post and products which are worth buying.